Hey Friends It's Erin from The Elementary Darling! 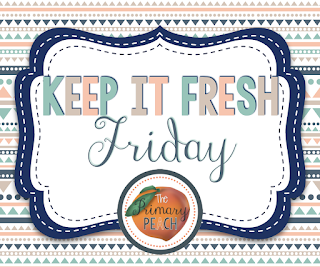 Today we are Keepin' it Fresh at the Primary Peach with some behavior code cards. In my school we use PBIS, so this is one strategy that we use for behavior and to control the chatter! It is pretty easy to use. I hold up the number of fingers while describing my activity or instructions. Then I put a magnet next to the code we are currently in, as a reminder to the students. I introduce this on the first day of school and the students pick it up really quickly. This helps keep the classroom chit-chat to a minimum. Code 1- Students can speak to the teacher. Code 3- Students can speak to their group. I have found that the students love the participation and are always referring to the white board to check. When it gets a little noisy, I raise my hand into a fist, to quiet the students down and remind them which code we are in, and the expectations of that code. It may seem simple, but the visual reminders are great for my students! These are in my TPT store for purchase, BUT because I am celebrating my last weekend of summer (we start school on Monday) I have changed them to free until Monday when I get up to go to school! Grab them here or click on the picture below! We are starting PBIS this year! I will have to remember your codes when we jump in....great idea!